Co-Owner of Alvarado Real Estate Group, Sara Alvarado, shares the work being done in the business community with Malik Anderson at The Madison Times. "Oftentimes, assumed differences inhibit people from realizing their similarities with other people, especially across social borders. These workshops allow people to safely explore, communicate, and unlearn their inner biases." Local organization 'Step Up: Equity Matters' aims to create safe spaces for the community to learn how to talk about race. Sara Alvarado, co-creator of Step Up, explained that oftentimes workplaces forget to bring people of color into the conversation of lack of inclusivity in those environments. 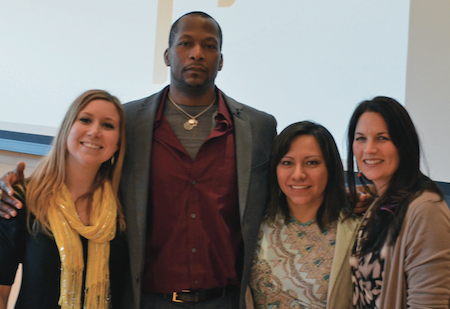 Alvarado, alongside co-creators Amy Kesling (Sustain Dane), Haywood Simmons (Motivational Expert, Phitness Plus), and Tania Ibarra (Latino Professional Association of Greater Madison) make up their core planning team.Step Up, which partners with the YWCA and receives support and training from their Racial Justice platform, encourages people of all backgrounds to begin conversations about race among their own communities. allowing them to move beyond the initial discomfort of talking about a contentious issue. Alvarado hopes that more businesses will start and continue to consider these conversations as valuable and necessary in working towards equity and inclusion in the workplace. Alvarado contends that diversity in the workplace is more than just checking off boxes, it's about "bring[ing in] people who have something to add to the company." For example, Alvarado, Kesling, Simmons and Ibarra each bring unique skill sets to the organization to convey to others the importance and benefits of creating an environment that's comfortable for all people. Each core-planner's personal and professional experience informs their contribution to the discussion of how to talk about race and how to combat racial biases. Part of why these conversations don't naturally happen is due to a common misconception. "Often people [of color] feel they are unvalued, but on the other side, white people feel they [people of color] don't want to be involved in that environment," Simmons said. Oftentimes, assumed differences inhibit people from realizing their similarities with other people, especially across social borders. These workshops allow people to safely explore, communicate, and unlearn their inner biases. Simmons added that ignorance and blame allows people to make excuses for themselves, avoiding important conversations on race and losing opportunities to grow and connect with others: "Our workshops are about making people uncomfortable, but making them uncomfortable using vulnerability as a place for growth." James Phetteplace, Director of Information Technology at the Willy Street Coop, had only positive things to say about his experience with Step Up: "[The] facilitators are highly skilled at presenting and discussing difficult subject matter, and creating an environment that values courage, action, and commitment." For Alvarado, the ideal situation in any business or place of work would be transparency about its own shortcomings with equity in the workplace, and also about its efforts to make diversity and inclusion a priority. The ideal is that a business "Walks it, talks it, and breathes it. It realizes it's not perfect," said Alvarado. Simmons views the work the core planning team does as important and empowering for people, and feels optimistic about the influence it will have on the individuals and organizations involved. "We have the tools to get these conversations going. There is hope," he said. It is a safe place to learn and grow and we invite you to be a part of the solution at www.stepupforequity.com.